Aidan Montessori School has grown from a mothers’ study group to a thriving institution, all while remaining true to our mission as an authentic Montessori school. Generations of Washington families have benefited from an excellent Aidan education. We hope that you and your family will continue to participate in the life of our school. Aidan families engage in the community of the school by sharing their time, talent, and resources as generously as possible. As Aidan looks back over more than half a century of providing exceptional Montessori education to the children of Washington, DC, we are grateful to the past and present members of our community who have supported the school over the years. Your gifts have helped to create the vibrant learning environment that supports Montessori teaching at Aidan today. It is our responsibility to ensure that this and future generations of students continue to receive the same opportunity for an Aidan education. If you have questions about making a gift or getting involved as a volunteer, please feel free to email us at advancement@aidanschool.org or call 202-332-2732. Thank you for your support of Aidan Montessori School! Thanks for helping us reach for the stars - our Galactic Gala was a stellar success! 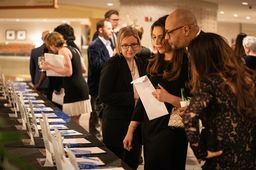 Check out the photos from our event on March 16. Galactic Gala: Tickets On Sale Now! 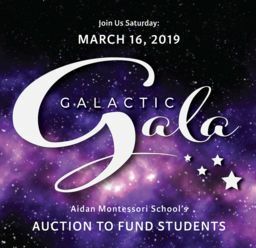 Have you reserved your spot for the Galactic Gala? Grab your tickets and join us on Saturday, March 16 for an evening that will be out of this world!